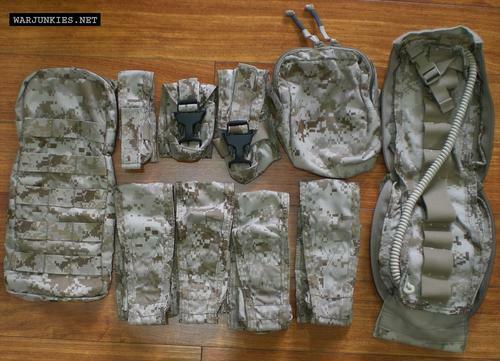 AOR1 (Area Of Responsibility) pouches by Crye Precision. After months – if not years – of speculation and rumour, it seems that we at last have resolution to the questions of what AOR camouflage is and who will wear it. I’ve seen several different names and descriptions pop up for AOR camo during this time – such as “digi2?, “MARPAT II”, “digi-MultiCam”, etc. – and any time a photo of s spec ops operator appeared wearing any kind of unusual camo, it was immediately suggested that he was wearing “AOR”. People had also suggested that it was some kind of secret, high-speed camo designed by Crye Precision and would only be used on their clothing and gear sold to US SOCOM. Finally it was even reported – either prematurely or inaccurately – that AOR 1 and AOR 2 were going to be officially adopted by US SOCOM as an alternative to UCP, MARPAT, NAVPAT and Air Force TigerStripe. Well, it turns out that the truth – as usual – is less sensational. So, first of all, exactly what does “AOR” stand for, and what is the pattern? AOR stands for “Area Of Responsibility” – in this case meaning either desert / arid terrain regions (AOR 1), or temperate / tropical forested terrain regions (AOR 2). And the pattern is the same digital pixelated pattern used for the NWU, MARPAT, UCP (ACU) and CADPAT camouflage patterns. Many people who’ve now seen AOR 1 and AOR 2 have mistakenly thought that they are simply MARPAT with the EGA logo element removed. Well, the AOR patterns do look very very similar to MARPAT, but as you can see from the images below, the colours are in fact slightly different.